The captain of a vessel that arrived on British Columbia's shores carrying hundreds of Tamil migrants did not break the law because he was acting on humanitarian grounds, a court has heard. The MV Sun Sea arrived off the B.C. coast in August 2010, carrying 492 people. The captain of a vessel that arrived on British Columbia's shores carrying hundreds of Tamil migrants did not break the law because he was acting on humanitarian grounds by helping his fellow asylum seekers, a court has heard. In closing arguments at a B.C. Supreme Court jury trial on Thursday, Sandy Ross said his client had no intention of piloting the MV Sun Sea when he paid for the trip as a passenger, but "was thrown into the role of captain" after the Thai crew abandoned the vessel. Ross's client, Lesly Emmanuel, and three other Sri Lankan men are accused under the Immigration and Refugee Protection Act of bringing hundreds of Tamil migrants from Thailand to Canada, where they intended to claim refugee status. The act doesn't apply to his client if his actions were humanitarian in nature, Ross said. "Based on Mr. Emmanuel's evidence, that's exactly what he was intending and why he did what he did." Emmanuel was no more complicit in organizing and facilitating the voyage than all the other passengers who contributed to the vessel's safe arrival to Canada in August 2010, Ross told the jury. "Mr. Emmanuel may have been captain, but there were people working in the engine room, people working in the kitchen, in the store room with all the food distribution, rain collection, tarping, record keeping," he said. "Many, many people contributed to the many, many jobs of keeping this ship moving forward," he added. "To crew a ship like this on a long voyage ... could only be accomplished through a co-operative effort. "And why did they do that? They did that because they were seeking asylum from the oppression and persecution they suffered or feared they would suffer in Sri Lanka. Their goal was to reach Canada and claim asylum." 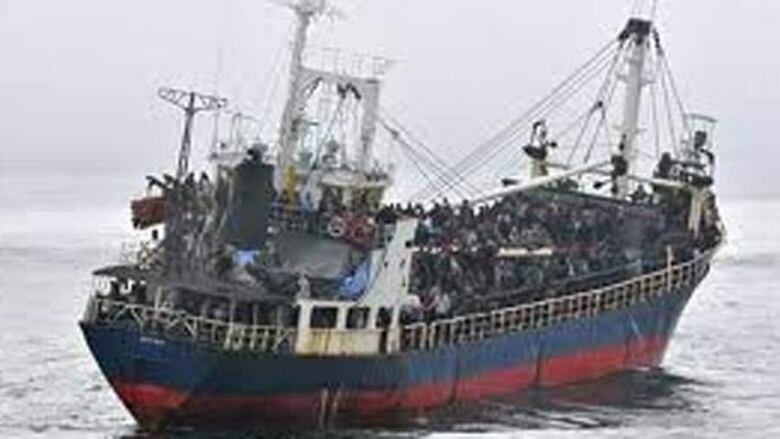 The MV Sun Sea left Thailand in July 2010, carrying 492 Sri Lankan Tamils. Ross described it as a poorly equipped vessel not designed for a trans-Pacific voyage and piloted by a makeshift crew. Also on trial and accused of human smuggling are Kunarobinson Christhurajah, Nadarajah Mahendran and Thampeernayagam Rajaratnam. All four men have pleaded not guilty. In his closing statements to the jury, Mark Nohra, counsel for Mahendran, questioned the reliability of the eyewitness evidence that describes his client as helping passengers board the MV Sun Sea. Referring to eyewitness identification, Nohra said, "There may not be another piece of evidence that we see in these criminal courts that is more prone to error." He also accused the Crown of making its case by relying on a "polluted stream of information," and alleged police and the border service agents failed to follow proper procedures when collecting evidence. "The RCMP broke almost every single rule designed to protect against wrongful conviction," he said. The pictures used for eyewitness identification carried identifying marks, Nohra said. The officer who presented the book was connected to the investigation and in one instance said "good work" after a photo was selected, he added. Closing statements are expected to continue on Friday.